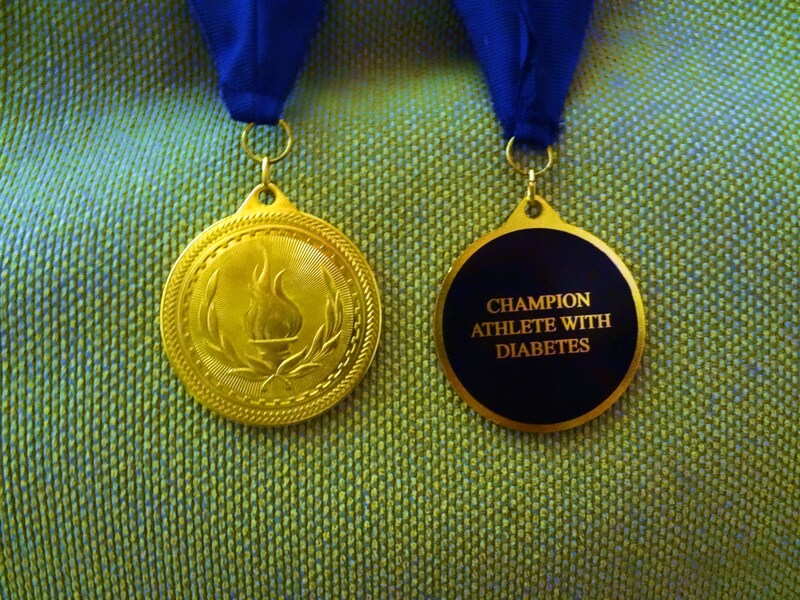 I’m so thrilled to tell you about our latest Champion Ahtletes With Diabetes. One of these winners you probably don’t know at all (though you’ll recognize who sent us the request). The other winner you know quite well. What you’ll recognize about these stories though is that it’s the stories that matter in this medal quest. My co-worker’s 7th grade daughter was diagnosed with Type 1 a week before school started at her sport physical. Tonight she found out she made the volleyball team (the whole reason for the physical that may have saved her life). It arrived yesterday! I gave the medal to Katie’s mom and she asked the volleyball coaches to give it to her at tonight’s practice. Perfect timing as tonight they were doing team building and motivation. A story like that just melts me right down to butter. Congratulations Katie! Our other medal winner this time is Mike Hoskins of Indianapolis. Mike writes at DiabetesMine, when he’s not writing at The Diabetic’s Corner Booth. It was my first-ever Tour de Cure on June 8, 2013 (I’m just inside the six month mark!). Here in Indy, at the Indy Motor Speedway and around that central part of Indianapolis. I’d signed up for a 50k because for some reason that was the shortest you could sign up for aside from the “family recreational” stretch just going around the 2.5-mile speedway track. I trained at least a few times a week in the couple months leading up to this event, around my neighborhood and the city on streets and bike paths. On the day of the tour, I made it a little more than 15 miles — about 25k which is half of the registered route. That was my limit, and at times it was very challenging for me, especially when it came to the non-level highways and streets around Indy that were very different from the smooth flat downtown streets and paths I’d been training on. This was the most I’ve ridden my bike as an adult, and I am very proud of pushing myself and going the distance that I did. It was never about making it to the very end or being first, because that just wasn’t me. 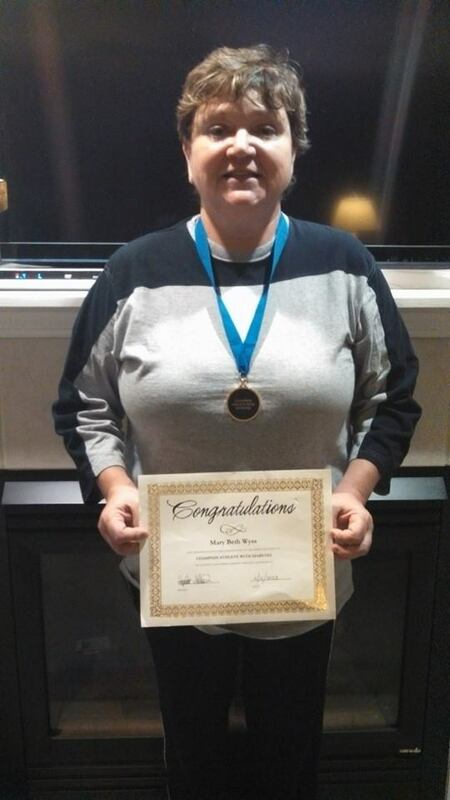 But I wanted to prove that I could do it, that I could push myself to my limit and not stop when it seemed impossible, and that no matter what that diabetes wasn’t going to stop me from doing this. Before the ride, and even during that time and afterward, it’s people like Scott Johnson, Mari Ruddy and George Simmons who I’ve seen accomplish their own athletic achievements that have really served as my biggest motivations and inspiration in believing I could do this, and pushing myself to make it happen. 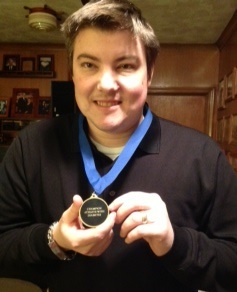 Mike also took the time to write about his achievement at DiabetesMine last week. You can read it here. Congratulations Mike! Okay, it’s your turn. 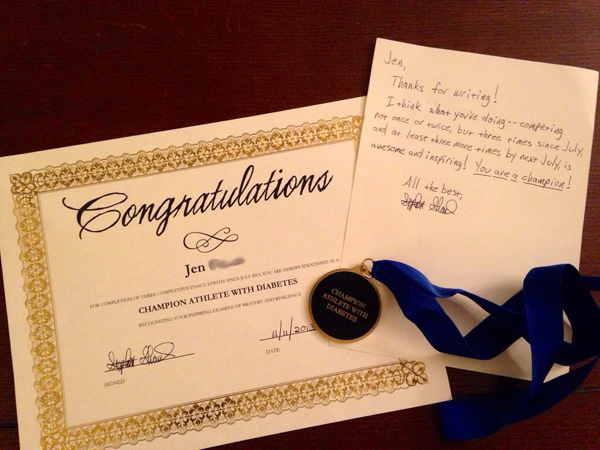 Time to write in and request the medal you deserve for accomplishing athletic goals. 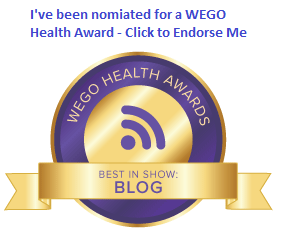 Time to nominate someone who inspires you. For more information on the Champion Athletes With Diabetes initiative, click here or send me an e-mail at happymedium[dot]net[at]gmail[dot]com. And don’t forget to follow @ChampsWithD on Twitter and like our Facebook page too! Athlete with diabetes? You deserve an award. Welcome to November 1st, the first day of Diabetes Awareness Month, 2013. World Diabetes Day is once again scheduled for November 14th, which is a Thursday. There will be many happenings this month, which I will do my best to keep track of over the next few weeks. You know, every year around this time, I see blog posts and Twitter conversations filled with “What are you going to do this year for Diabetes Awareness Month or World Diabetes Day?”. And to me, that question is always kind of intimidating. I mean yeah, it’s helpful to remember that one thing at a time is important, and small changes can have a big impact. But when I hear that question this time of year, I don’t hear “What are you doing?” as much as I’m hearing “What big, gargantuan thing are you doing that will wow the masses?”. Well, I don’t know if this will wow the masses. But it’s an idea that came to me a few weeks ago, and I’m going to try it and see if it gets any traction. If it does, great. If not, no big deal. What am I talking about? I’m glad you asked! I am constantly in awe of athletes with diabetes. Not just the ones that climb Everest or run the Sahara desert. I’m also in awe of those people who get up and make a commitment to exercise, and keep going, despite how our bodies initially respond to said exercise, and in some cases, what years of insulin, and diabetes in general, does to our bodies (raising my hand here). Seriously, as an athlete prior to and after my diagnosis, I can tell you that it is waaaay more difficult to start and maintain exercise as a Person With Diabetes. It can be both scary and exhilarating all at the same time. Yet, competing in events and going to the gym generally means you’re competing for the fun of it. No prize money, no podiums, you get the idea. Very few events give out awards or medals to anything lower than the top three finishers, if they give out anything at all. But the efforts of all of us are worthy of recognition and support. If you finish your first 5K run, if you ride your bike 50 miles, if you get up and hit the trails for a week when you haven’t gone for years, you’re a champion in my book. And I want to give you a medal. Your effort as an Athlete With Diabetes should be recognized and rewarded. So I had this crazy idea to see how much it would cost to have medals produced. They aren’t Olympic medals, but they turned out nicer than I thought they would. And I thought the blue ribbon was a nice touch. Maureen and I sat around this week and came up with a few simple rules for getting your medal. You are encouraged to send a request if you are an Athlete With Diabetes, a spouse or partner of an AWD (see what I did there? ), or an awesome parent of a kid Athlete With Diabetes. 3. Send me an e-mail at champswithdiabetes@gmail.com. Tell me your name, name of the athlete (it’s okay if it’s you), and your address (gotta know where to send the medal). Most important, tell me what athletic goal was accomplished, and when. Extra points if you tell me how you felt accomplishing the goal. 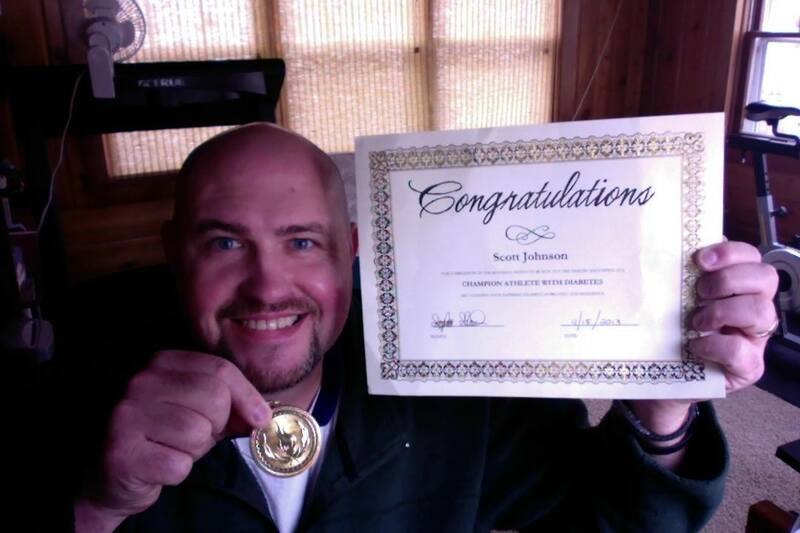 Full disclosure: I reserve the right to use your testimonial here, on Twitter, and on Facebook. Let me know if you don’t want me to use any names. 4. When you receive your medal, you need to post a photo of it around the athlete’s neck. You can send a Tweet to @ChampsWithD (hashtag: #champdathletes) or post it on the Champion Athletes With Diabetes Facebook Page. Those are the only rules so far, though I reserve the right to change them as this thing develops. Not to make it more restrictive. To make it more fun. I have all of 24 medals to send out. If this idea takes off, I’ll order more. If not, we’ll all forget about it by December. So instead of asking what big thing you’re doing this month, I’m asking: What big athletic goal did you complete? Send me your e-mail today.